“I believe in sugar,” confesses Merri Tyndall, whose slender figure suggests otherwise. But the proof is in the pudding, and in the pies, cakes, and other goodies she and her husband, William, bake up at Mountain Pie Company in Hendersonville. Also a tearoom that serves breakfast and lunch bites on dainty old-fashioned china, the company offers around 50 made-to-order cakes and pies of the 1930s and ’40s, including rum cake, lemon meringue, coconut custard, and shoo-fly pies, and an award-winning apple pie. A baker since childhood, Tyndall also likes to experiment. 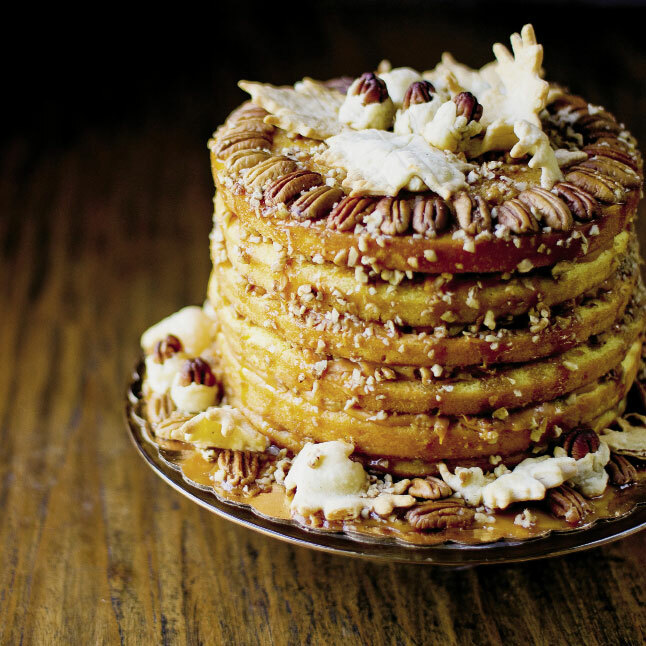 Her Pecan Pudding Cake is an original take on the apple-stacked version prepared by early Appalachian homesteaders. Standing six inches tall, with layers of butterscotch chips, caramel, and vanilla pudding and decorative piecrust leaves and acorns, it’s a sweet fall treat. Mix and bake as directed on the box using nine-inch round greased pans. You will need six thin layers of cake. Allow cake to cool completely before turning out onto parchment paper. Tyndall recommends making the cake and decorative leaves a day in advance to save time. Mix pudding, evaporated milk, and cornstarch in a microwaveable bowl until smooth. Heat in microwave for 10 minutes, stirring every two minutes, until pudding begins to curdle. Remove and add butterscotch chips and two cups of pecans. Mix and let cool for 15 minutes. Place a layer of cake on a cake plate or stand and top with filling. Continue with remaining layers. Top generously with caramel sauce (Tyndall recommends Smuckers’ caramel topping), allowing it to run over the edges. Place leaves and pecans around the bottom and on the top. Sprinkle with remaining chopped pecans.